I purchased these as I expected them to feel very similar to the Empire SLX, but provide on-the-fly adjustability with the BOA dial. They are not as comfortable. From the beginning I felt pressure on the top of my foot from the strap that I did not feel with the SLX. If I loosened the BOA too much, the tongue slid down the side. That said, I am probably an outlier and you should give them a try. They are light, clean up well and otherwise comfortable. Personally, I did not see the benefit of the unique velcro-lace combo. If you want straight up adjustability, just go with a full BOA shoe. For me comfort is paramount and the SLX and the most comfortable shoe I've ever worn. The hybrid lace and Velcro strap, plus a Boa dial makes it easy to adjust the fit on the fly. I found these to be true to size, very stylish, lightweight and extremely comfortable on and off the bike. Picked these up on a Westernbikeworks sale at a great price. Moved from Sidi Wires to these shoes. The Giro's are signifcantly lighter and have a more slipper-like feel to them. The heel is not held as tightly as on the Sidi, so it takes a few rides to get used to that feeling. But overall comfort on these things is amazing. Also, even though they are super lightweight, the carbon sole is stiff enough that you get good power transfer. If there was one negative, I'd say the Techlace system is not very useful. I think the shoe would have been better with a second Boa dial instead. I usually never adjust the Techlace straps and just rely on the top dial for tightness and retention. Ive always liked the Giro Factor cycling shoes and the new updated Giro Factor Techlace road shoe does not disappoint. Very easy to adjust the laces via the velcro and the boa design works perfectly. Its not only a great looking shoe as I get lots of compliments, it is also very comfortable. The stiffness and support will give you confidence weather your climbing or sprinting. Im very happy with these road shoes. Super light weight shoe. Much lighter than my old Sidi's. Fit must be fairly narrow as they comfortably fit my lady-like feet. Only downside is that the white dirties up pretty quickly. The closure is super nice, with heavy duty velcro or high quality ratchets that are easy to adjust on the fly. I have high arches, so I really like the fact that they include different arch supports to personalize the fit. Overall, very high quality build. Buying them on sale made the deal even sweeter! I have a wide foot and typically struggle to find bike shoes that are comfortable. These are wonderful. Even after long century rides, my feet aren't angry at me. I also do triathlons and am able to get in and out of these shoes very quickly. I like everything about them. I ride about 5,000 miles per year as a recreational road cyclist. The wide size of these shoe perfectly fit my wide foot. They're extremely light and the instep insertions makes the shoe fit my foot like a glove. I like the looks of them as well. I got these at a steal of a deal. They out perform my other road shoes (specialized) by a mile. I would've loved to have a boa system, but this makes no difference on this model. It's just a fast. 2nd pair of these, first ones wore out at the toe and heel. New ones fit great and are super light! Soft leather, breathable, nice fit. Super happy so far! 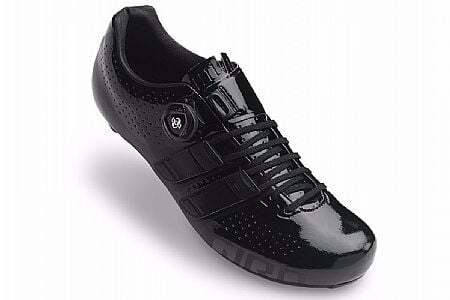 This is my second pair of Giro shoes. I also own the Empire lace version. The fit and comfort of these shoes is incredible. The adjustability of instep selection helps to find just the right fit. The soles are very stiff which is especially noticeable out of the saddle. The ratcheting system is solid and easy to adjust on the bike. I would buy these again, but the solid build quality will make that unnecessary for years. The sole is stiff and the upper materials are very good. Straps work well to get uniform pressure. Not the coolest shoes in terms of ventilation, but after a few rides, I didn't notice this. Lack of ventilation may make cool weather riding better!